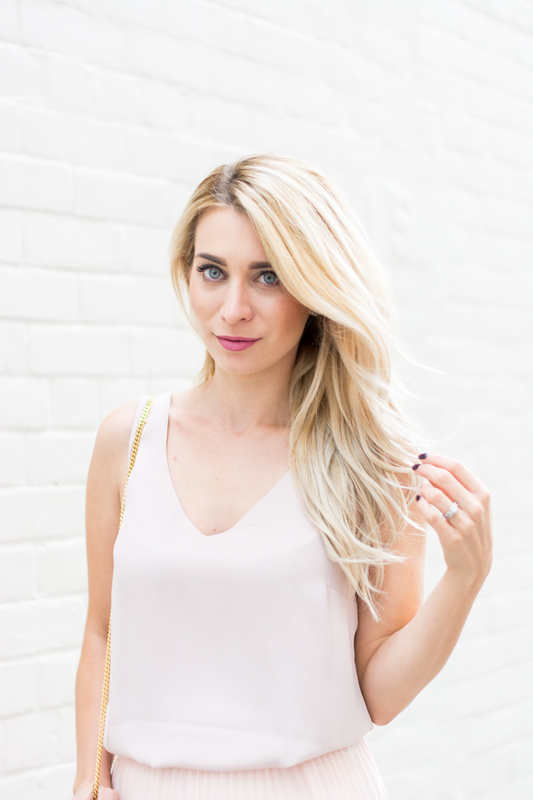 OOTD - Blush Pink For Fall | La Petite Noob | A Toronto-Based Fashion and Lifestyle Blog. Definitely a moody lip and darker nails! Totally makes an outfit fall appropriate! Love the blush, as always. This is such a cute outfit! I love anything and everything pink, so that skirt and heels are like, yes please! I'm all about the cozy cardigans for fall, and bold lips! Yes! I love a bold lip on you! Makes me want to be more adventurous with my makeup. Thank you Eleni! OMG I know - the other day I was wearing a sweater and a scarf on my walk into work, and shed them all to walk home in a t-shirt! What's going on?? I absolutely loooove those shoes!! PERFECT!